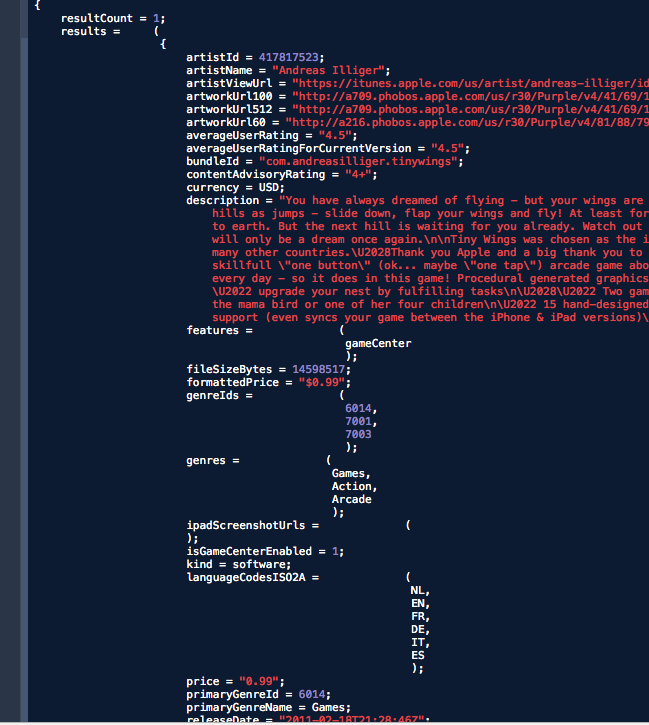 Anyway, I was playing around with iTunes Search API and found out that the reply is in JSON. And I love JSON, so I started to extract the data and put it in a simple TableView and Voila! Initially I thought it'd be great to have a personal app so I can have a birdseye view of all of my apps. Especially the current price that I set to each one. Sometimes I set a different price (eg do a promo 50% price cut) and then I totally forgot to set it back somehow. Sure I can just open App Store but then App Store data display in the developer page is too simple. I also would like to see ratings, and current version number too all in one shot. So that is why I made this More Apps.. page. It is DYNAMIC. That is it displays exactly how it is in the Appstore. 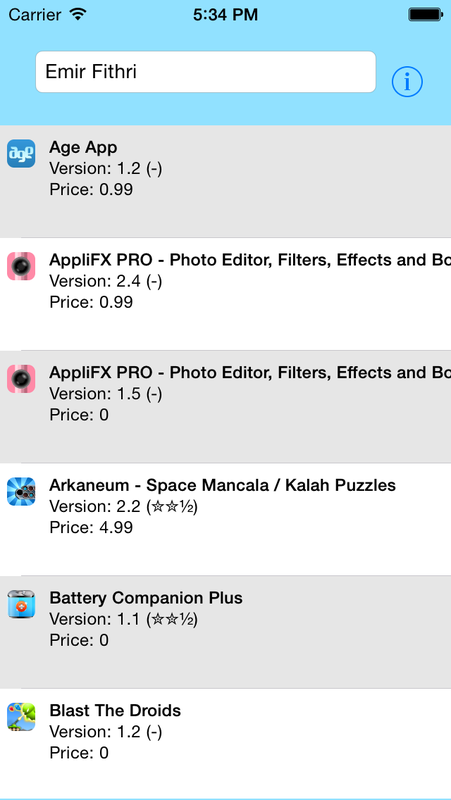 New apps released will be automatically available to this page! Remember to connect all of the IBOutlets, Delegates and DataSource for TableView. There are many ways to do a URL request. That is, in a way, doing a HTML Form submission inside an iOS app. The devName is the UITextField that we added at the top. Note (see in project) that we are running this code in an autoreleasepool. And I use a custom made "progress window" called BusyAgent to show the status while searching. This eliminates the impression of "app hanging" while the app is processing in the background. Then we update the status in mainthread using [self performSelectorOnMainThread...] method. If you are getting a matched result for your search query (ie your developer name), the log window will display NSDictionary data containing all available data of your apps. appDict is a NSDictionary initialized in viewdidload. You can add in codes to handle the error and timeout too, but Im not doing that for this tutorial. There are 2 main dictionary keys from iTunes data - resultCount and results. resultCounts value is the number of apps found matched to the devName.text. And results are the array of each apps data and each app data is encoded as NSdictionary. So basically we get a NSDictionary with value of arrays of NSDictionary! What we need is the app data in results. So we load the value of "results" into NSMutableArray, and now we have an array of apps data! Now we can use these data in our app. But how do we put many details in our UITableView? Easy, we just customize the cell by code. There are many ways to customize cells, for example by using Prototype Cells in Interface builder etc, but me, personally I prefer doing things programatically. So everything is done in UITableView delegate called - (UITableViewCell *)tableView:(UITableView *)tableView cellForRowAtIndexPath:(NSIndexPath *)indexPath. There are 2 parts of codes in this delegate function. The first is inside "if (cell==nil)" and the second part is outside of that if statement. What does this mean? You need to understand what this delegate does. It basically returns the Cell object to the table. This means, when you reload the table (ie refresh) or simply scroll the table, the cells will be drawn according to the codes in "if (cell==nil)", ONCE. This is where we customize the components inside our cell. 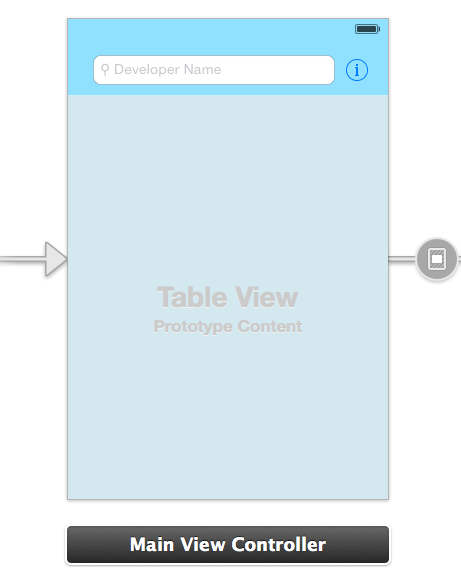 Each cells have a "view" object and it is called contentView. So basically we can addSubview ANYTHING into this contentView. Here we see, I added UIImageView, and 3 UILabels. The creation and addition to contentView must only be ONCE when cell is undefined. But once it is created, there is no need to do so. So, what is happening in the second part of the code? The rest of the code simply updating the content of each object. Note the use of object's TAG number to identify each components. To extract any app data from the appArray variable (this variable is retained through out the viewcontroller), call out the dictionary object at a particular index. In your app, you can remove the UITextField and simply hardcode your developer name in the request URL. And execute searchForApps in your viewDidload / viewDidAppear method. PS. I forgot to mention, the icons are saved in your sandbox. So it will take some space. But the icon i chose is a small one. Each icon is about 10kB. You might wanna choose a temporary directory to save them in instead of the normal Documents directory of your sandbox. Or simply write a delete routine everytime you close the page.